Dorothy Buffum’s father started Buffum’s department stores which became a chain of sixteen high-end department stores. She married Harry Chandler’s eldest son Norman Chandler (publisher of the Los Angeles Times from 1945-1960). They met at a dance at Stanford. During World War II Dorothy Chandler took control of the Los Angeles Times Women’s Section. She refused to be identified as a feminist, but actively took part in women’s issues. She turned the Los Angeles Times into a more moderate newspaper, and tended to take the liberal side of issues. Dorothy (aka Buffie or Buff) in all likelihood saved the Hollywood Bowl from annihilation. In 1950 it closed for the summer season due to finances. Her fund raising efforts allowed the Hollywood Bowl to stay open. She later became the chairman of its parent corporation. In the 1950s Dorothy and Norman Chandler lived in a Beaux Arts mansion at 455 South Lorraine, The Chandlers hosted Presidents Eisenhower (who Dorothy exerted strong editorial support for during his run for the Whitehouse), Kennedy, Johnson, and Nixon. Their home was referred to as the Western White House during this period. 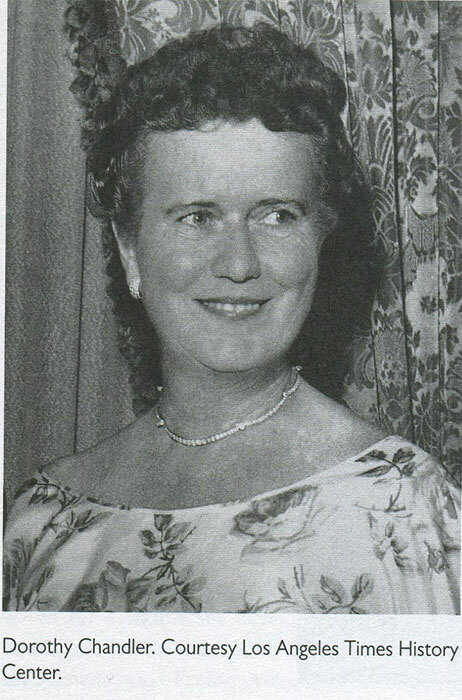 Dorothy Chandler was a University of California Regent from 1954-1968. During this time the U.C. System grew from five to eight campuses, and UCLA developed an international reputation. 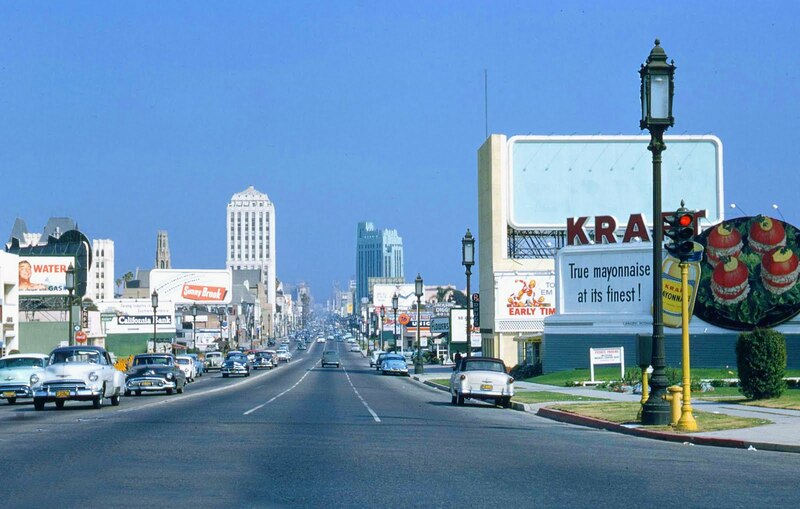 Beginning in 1954, Dorothy Chandler began a ten year campaign to raise funding for a music center in Los Angeles. She believed that without this cultural achievement the city her in-laws built would never make the map. A large part of the funding to build the music center came from the Jewish community. Myford Irvine, Mark Taper (as in the Mark Taper Forum) and Howard Ahmanson (as in the Ahmanson Theater) were primary contributors. The Grande Dame of Los Angeles Culture died in 1997. The color picture of the Pavilion was taken by accident when I was walking away from the downtown Los Angeles civil courthouse across the street. My cell phone snapped it. Although I do not get to see many shows at the Pavilion, I always see what is playing there when I use the parking elevator to rise to the street level in route to court. Yes, I am a proud parking patron of the underground garage.